The government is facing criticism its school league tables are a "nonsense", after steps to make exams more rigorous led to more failing schools. The number of schools failing to meet government benchmarks on GCSE grades and progress has doubled to 330 schools in the wake of the changes. Both private and state school heads now say the changes make the league tables nonsensical and irrelevant. But Education Secretary Nicky Morgan insists the tables are still useful. The changes include tougher exams, banned re-sits and some vocational and academic qualifications being stripped from the tables. Scores of renowned private schools have ended up at the bottom of the GCSE tables, despite dominating the top of the A-level tables and sending many pupils to some of the best universities. Schools such as Eton, Harrow, Winchester and St Paul's scored 0% in the government's benchmark measure of five good GCSEs including English and maths. Schools with fewer than 40% of pupils reaching this are deemed to be failing. This is due to the fact that, in some independent schools, pupils have been studying versions of qualifications, such as International GCSEs, which have ceased to be recognised in the tables. These qualifications are also studied in many state schools, which have also been affected by the changes. Users of the BBC News app click here to search for a school by postcode. School performance data released by the Department for Education - based on last summer's exam results - shows that on average 56.6% of pupils in state schools in England achieved the benchmark of five good GCSEs including maths and English. This is a decline of four percentage points on 2013, when 60.6% of pupils in state schools reached this benchmark, but many now claim the changes make these results incomparable with previous years. From this year, only a pupil's first attempt at a qualification is included for league table purposes. This was aimed at ending the practice of schools entering pupils for re-sits to boost their ranking. The list of qualifications included has also been restricted to those the government says are of the highest academic quality, and the number of non-GCSEs counting has been capped at two. Should parents still trust the league tables, after all the claims that they are lost in a mire of confusion? Head teachers and teachers have always disliked them - as they seem to boil down huge amounts of effort to a simplistic ranking. And this year, staff are particularly aggrieved because of the chopping and changing about what's included. They feel a bit like football managers, another group in the results business, who face the points system for the league table being changed halfway through the season. But let's be honest. As parents, trying to find our way through the data-jungles of modern education, a bit of brutal simplicity can be helpful. It's useful to know how many pupils got good grades in key subjects and how that compares with other local schools. What perhaps can be taken with a pinch of salt is the impact on national benchmarks, with some high-achieving schools scoring 0%. Head teachers might be giving ministers the same "nul points", but parents are still likely to be checking out their own local league tables. The school with the best GCSE results was Pate's Grammar School in Cheltenham, Gloucestershire. Defending the changes, Education Secretary Nicky Morgan said: "For too long pupils were offered courses of no value to them and schools felt pressured to enter young people for exams before they were ready. "By stripping out thousands of poor quality qualifications and removing re-sits from tables, some schools have seen changes in their standings. "But fundamentally young people's achievement matters more than being able to trumpet ever higher grades." Richard Harman, chairman of the Headmasters' and Headmistresses' Conference (HMC), which represents many leading independent schools, said the decision to drop IGCSEs made a "nonsense" of the tables. "Several of the UK's most highly performing independent schools and others offering this excellent qualification will now appear to be bottom of the class in the government's rankings," he said. "This obviously absurd situation creates further confusion for parents as they cannot compare schools' performance accurately and transparently. "Many HMC schools will continue to offer the IGCSE, as experience tells us it is rigorous and offers a good basis for sixth-form study." 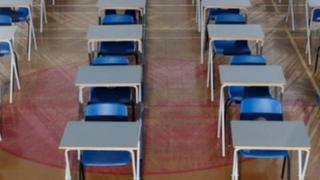 Brian Lightman, general secretary of the Association of School and College Leaders (ASCL), said "quite a few schools have fallen foul" of the various changes to school league tables "by continuing with exams that don't count". Media captionEducation Secretary Nicky Morgan says league tables show "a period of transition"
"In spite of this, the children themselves have received a good set of qualifications," he added. "This calls into question the validity of the performance tables. "The government has promoted these qualifications [IGCSEs] heavily in the early years of the coalition, but now they have decided that they want everyone to do the new GCSEs. "Lots of independent schools are carrying on with IGCSEs and have no intention of stopping - their reputation goes beyond the league tables." He said some state schools had been "caught unawares", adding many were already unhappy with the way their results had been presented in government data. Now his association has launched alternative performance tables aimed at giving a more complete picture. A spokesman for the Department for Education said: "As part of our plan for education, we are making GCSEs more ambitious and putting them on a par with the best in the world, to prepare pupils for life in modern Britain. "We have made important changes to a system that rewarded the wrong outcomes. "We have stripped out qualifications that were of little value and are making sure pupils take exams when they are ready, not before." The DfE added that in some independent schools, pupils had continued to be entered for unregulated qualifications that did not count in performance measures, such as IGCSEs, and not been moved across to the regulated certificate versions. "The effect of this has been enhanced in 2013-14 by the final group of unregulated IGCSEs reaching the end of their grace period and not being included in results." Head of the Nasuwt union, Chris Keates, said: "Every year the coalition government has changed the basis on which school performance is measured. "It's unacceptable that schools, teachers, parents and children are subjected to this negative annual ritual." And the National Union of Teachers argued that frequent changes to the league table measures meant that "yesterday's success story becomes today's failure - even though a school's quality will not have changed". Shadow education secretary Tristram Hunt said parents and teenagers would be greatly concerned by the confusion, adding: "Parents deserve to know exactly how their child's school is performing - but under this Tory-led government, all they've got is confusion surrounding school results year on year."